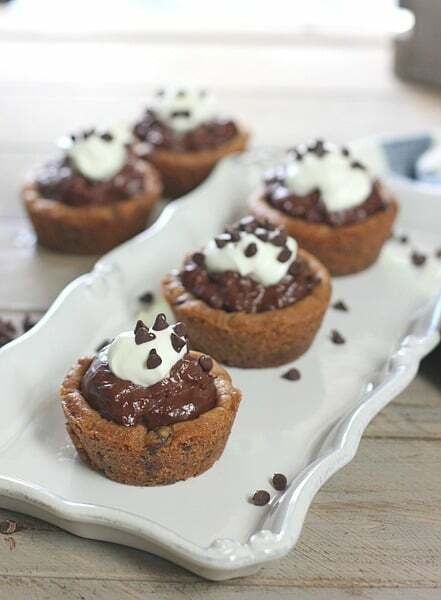 Chocolate Cream Pie Cookie Cups! – How cute are these! I’l take two! 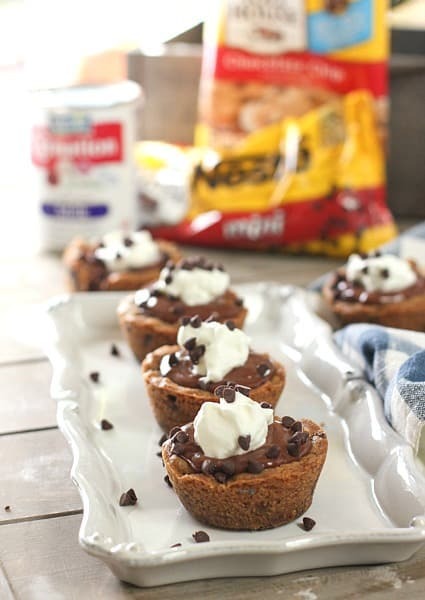 Cookie cups made from store bought ingredients that your kiddo’s will love! Wouldn’t the kiddos love to come home from their first day of school to a couple of these beauties! 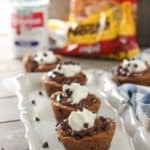 How to make Chocolate Cream Pie Cookie Cups! Not only are they cute, they are super easy to make! 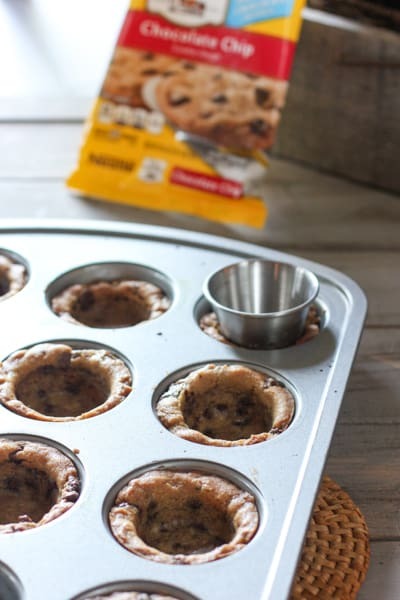 You simply press the dough in a regular size muffin tin…no need to go out and buy a mini size muffin tin! Fill with a super easy pudding recipe and top with a dollop of whip cream and a sprinkle of mini chocolate chips! When the cookies come out of the oven, use any round object, (I used a condiment cup but spice jars work great too!) and press into the hot cookie, forming a cup. How clever is that? Let cool fully before removing the cookie cups. Run a knife around the edges and they should just pop right out! While the cookies are baking and cooling, make your very simple chocolate pie filling. It takes only 5 minutes! 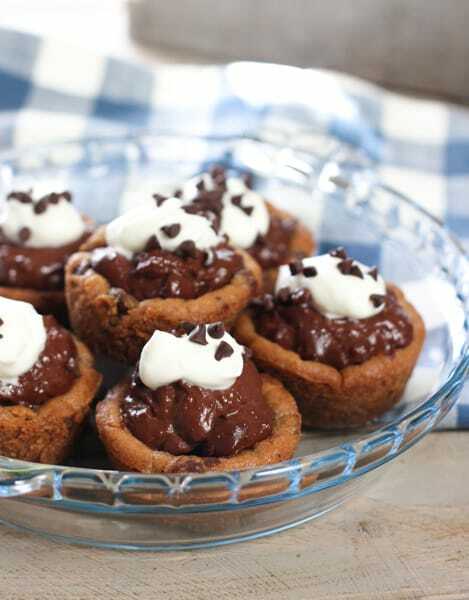 Fill the cookie cups with the cooled pudding, top with whip cream and garnish with the chocolate morsels. Your kids are soooo gonna love you for this! An easy to make treat that your whole family will love! Spray a standard size muffin tin with non stick spray. 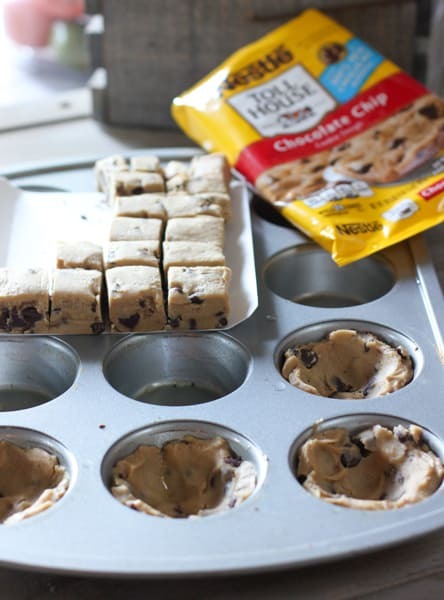 Press 2 squares of cookie dough into prepared muffin tin. (It doesn't have to be perfect, you are going to make an indent after they are baked). Bake for 10-12 minutes until edges are brown. Using a round object like a condiment cup or spice jar. Press into the hot cookie to form a cup. Cool completely and remove from muffin tin. In a medium sauce pan, combine sugar, cornstarch, cocoa and salt. Add evaporated milk and water. 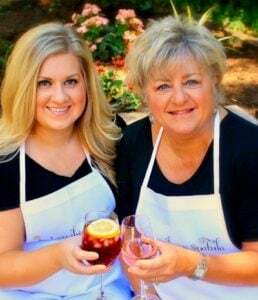 Stirring with a whisk. Heat over medium heat until thick. About 5 minutes. 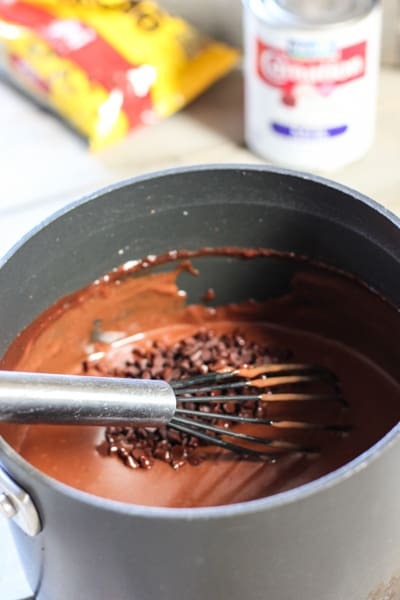 Remove from heat and stir in chocolate chips. Whip together heavy cream and confectioners sugar until soft peaks form. Fill cooled cookie cups with cooled pudding mixture. Top with whip cream and garnish with chocolate chips!